It feels like soup. Soup season, soup recipes, soup meals, just soup everything. I’m probably one of those who can eat soup for dinner. And while most of my soups here are filling, not all of them are a meal on its own. This white bean soup however is. On a side note–if it wasn’t for soups, I don’t know how I would survive you January! Is it just me? I dislike the idea of settling into a new year, new resolutions/plans, new everything. Thank Goodness for good food to get me through! There’s something incredible about kale. I’m one of the very first people who hopped on the kale wagon and I’m loving it. There’s also plenty of Kale recipes here on the blog in case you’re skeptical (just search the word kale in my search bar). Finally, try to read this Kale Salad with Spicy Lentils post where I write so much about massaging kale and more! 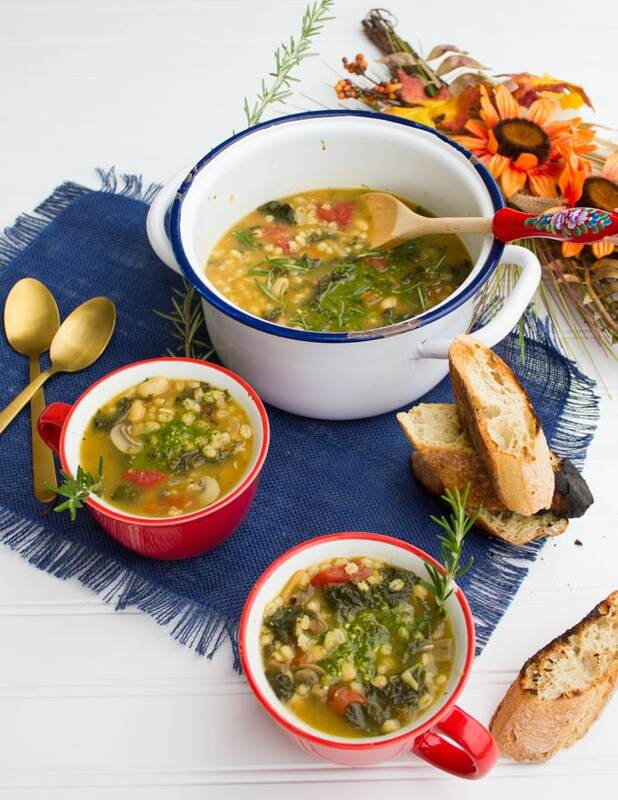 In this white bean soup, the contrast of creamy white beans and bitterness of kale is so delicious! You can definitely use spinach rather than the kale if you prefer. The other ingredients like chopped tomatoes, chewy barley and mushrooms just add the perfect flavor and texture for a hearty soup. Like all soup recipes, this one starts with sautéing onions, garlic and mushrooms. Then you’ll add in the chopped tomatoes, broth, barley, white beans and let the soup cook well. What you’re looking for is for the barley to cook, because everything else is pretty much cooked. If you choose to start with uncooked white beans, then you’ll add it with the broth and let it cook for over an hour until it’s soft. At that point you’ll continue with the barley and remaining ingredients. The kale goes towards the end of the soup, just add in a bunch of kale leaves. Make sure the stems are removed because they can be really bitter and tough to chew. 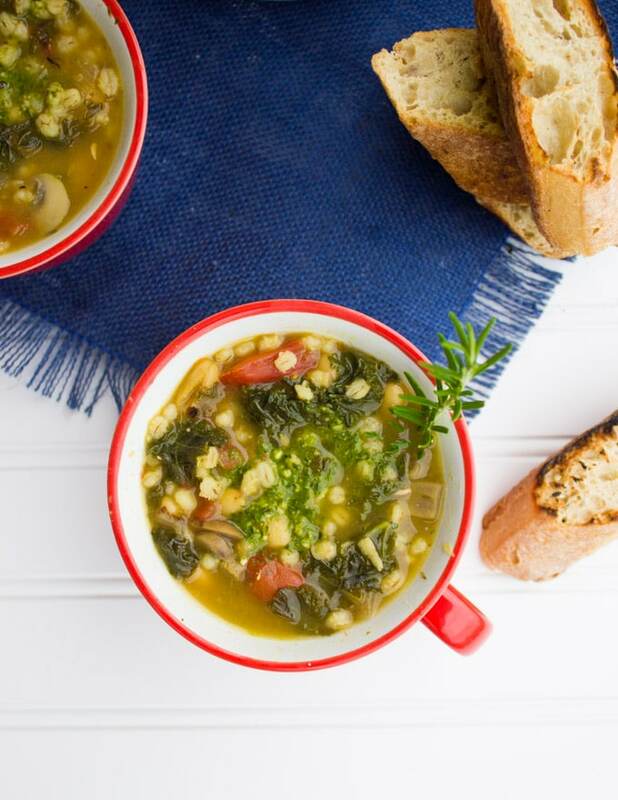 Garnish this heartwarming white bean soup with some kale pesto (ok maybe I took it too far with kale lol). Basil pesto is a great alternative, and sprinkle some Parmesan cheese on top if you like (vegan or regular). Make sure you sauté the onion well before proceeding with the remaining ingredients in your soup because you don’t want your soup to taste like raw onion! Using canned white beans is convenient, but you can use raw uncooked beans too. Start by adding it at the beginning and wait for at least an hour until it’s soft before proceeding with the soup recipe. Add in some of your favorite stuff like carrots, celery, corn, etc. 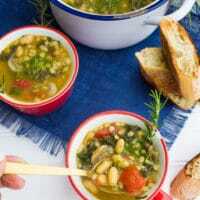 It just adds more goodness and texture to a classic Tuscan white bean soup. 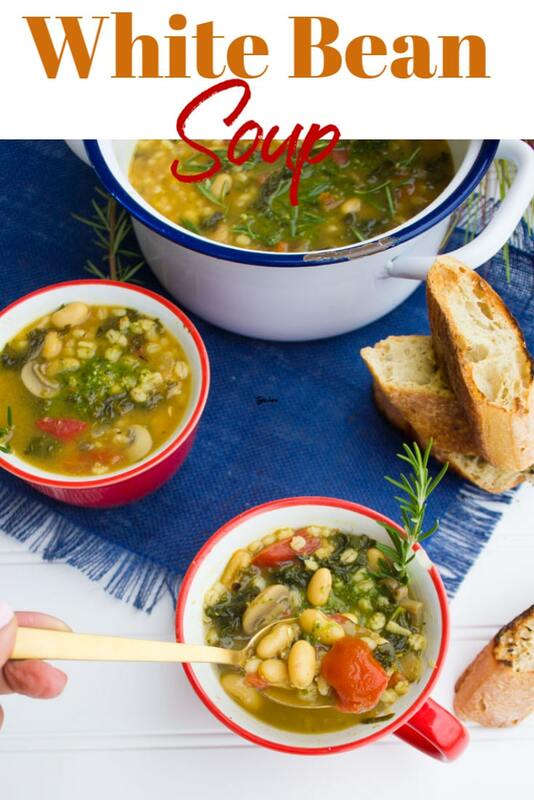 This is a great vegetable soup recipe, it’s actually a vegan soup too, but if you’d like to add some shredded chicken to it, add it with the kale towards the end. This soup recipe keeps in the fridge for about a week and freezes really well. These are some of my favorite full meal soups that are really filling. Moroccan Lamb and Turmeric Lentil Soup-need I say more? Quinoa Sweet Potato Lentil Soup-a must try! The Best Lasagna Soup-crowd pleaser and super kid friendly! Sweet Potato Black Bean Soup-a classic with a twist too! Soothing Garlic Chickpea Soup is a street food soup that’s one of my favorites. And finally this Creamy Peanut Soup with Peanut Crunch Herb Pistou, while it’s not filling like the rest, it’s one African delight recipe you need to try! 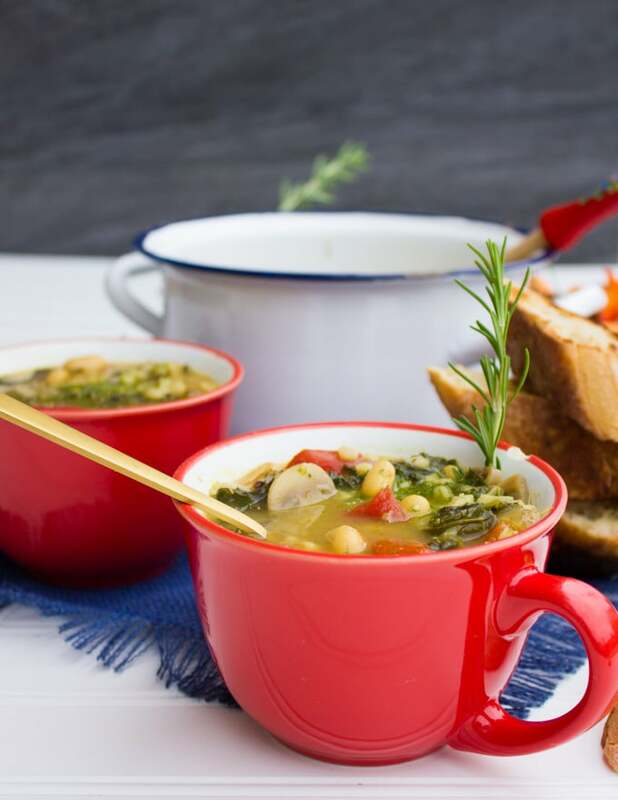 This heartwarming White Bean Soup Recipe is loaded with tomatoes, kale, mushrooms and barley. 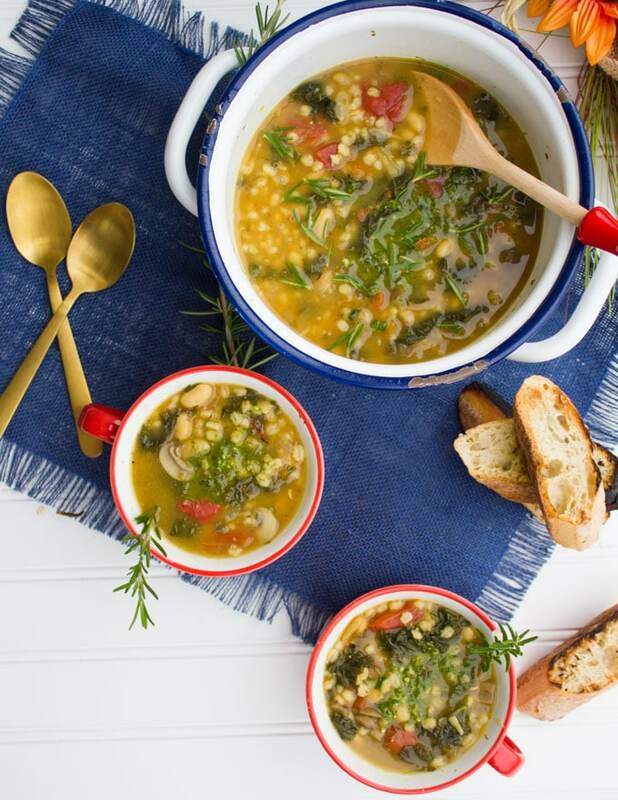 It's like a Tuscan white bean soup, but with a twist. Don't miss this soup recipe, it's vegan, filling, hearty and super delicious! In a medium stock pan, sauté the onion in olive oil for 8 minutes until soft and golden. Add in the mushrooms and garlic and sauté for an extra 5 minutes. Add the broth and barely and bring the mixture to a boil. Cover the post and let it cook for 30 minutes. Then add in the remaining ingredients and boil for another 30 minutes over low heat. Serve the soup with some pesto and Parmesan cheese if needed. This was absolutely delicious!!! The first recipe of yours that I tried and I think it will be a new staple in my house. After eating some for dinner, I brought some soup to work for lunch and I colleague remarked, “That looks so good! 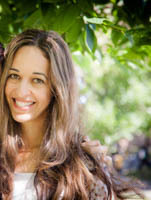 Like something off of pintrest.” I’m looking forward to making more of your recipes. This is what I call the perfect comfort food! So hearty and warming! My kind of winter meal! Such a delicious looking soup! Can’t wait to try it! The perfect soup to enjoy on this very cold January days!! I can’t wait to try this!! It looks SO hearty and delicious!! Yes Katerina, hope you make it! Love all the added veggies! So hearty and comforting! This will help warm me up today! 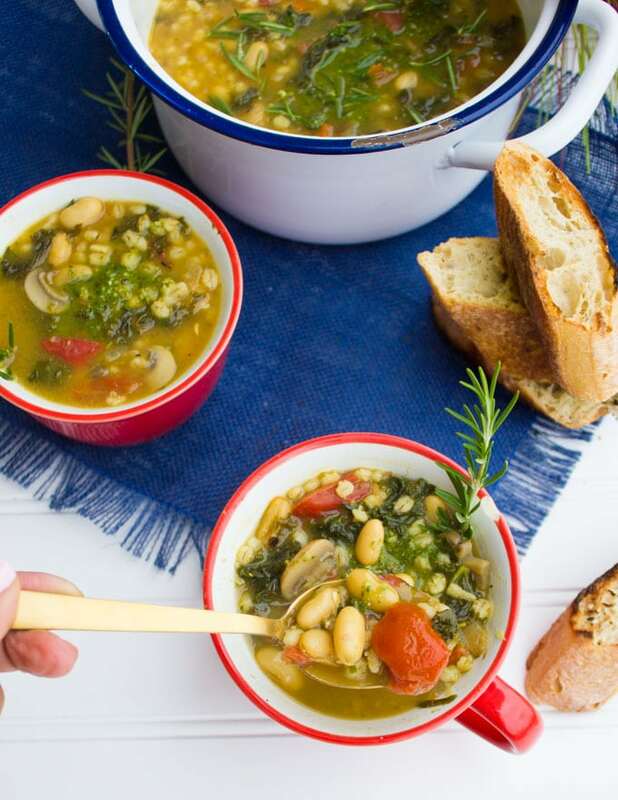 This bean soup looks so hearty and flavorful! Yummy! I wish I had a big bowl of this soup right now! It looks so yummy! exactly what I needed for this cold weather we are having!! Such a delicious recipe! Thanks for the tip of removing the stems of the kale before tossing them in the pot! This was exactly the soup that I needed today. So warm and filling. It was delicious! Thanks for making this Sabrina! Such warm and comforting soup!!! YUM! This soup is exactly what I need now with this cold weather outside! Looks amazingly good! My type of weeknight winter dinner! Full of flavor and veggies! Such great flavor and so delicious! Yum!